Audi a5 8t coupe convertible diffuser rear focus s-line look vfl. This product page has been automatically translated. If you have any questions, do not hesitate to contact us. Give you their a5 coupé cabrio s-line search. Rear diffuser in audi a5 8t coupe / cabriolet s-line look. 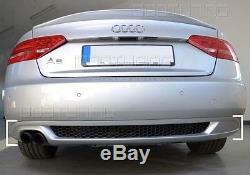 Audi a5 8t coupe / convertible rear diffuser s-line (only suitable for a double pipe final left). Sadapte on the rear bumper series by bj. / 06/2007 to 07/2011; not suitable for s-line, s5 or rs5 rear bumper. New, without primer and painted. High quality fiberglass (composite fiberglass) color: black. First class surface structure allows convenient painting. More parts for 8 a5 t like the front spoiler, side skirts, rear spoiler, etc. You have the following secure payment methods. 1000tuning thomas lawrynowicz haderslebener str. Please note that in countries outside the European Union may belong to customs fees. The item "audi a5 8t coupé convertible diffuser s-line rear focus look vfl" is on sale since Thursday, January 5, 2017. It is in the category "auto, motorcycle parts, accessories \ tuning, styling \ bodywork, exterior \bumper". The seller is "1000tuning" and is located at / in pinneberg. This item can be shipped to the following country: european union.